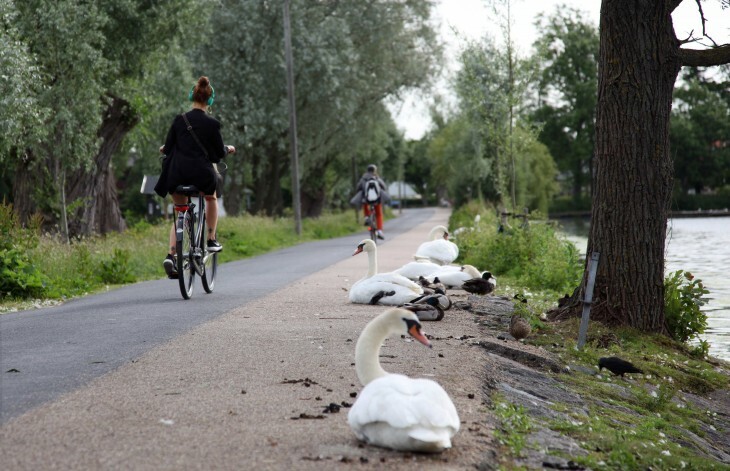 The Albertslund Bikeway is Copenhagen’s first bicycle superhighway for commuters. But it is also a green trail that explores the city from suburban gardens to dense urban districts. The route begins in idyllic fashion in a valley near a golf course. 17.5 kilometres later, you arrive, a little out of breath, at Vesterport Station in the heart of the capital. The Albertslund Route, known as C99, has made it faster and easier to be a bike commuter. As far as possible, the route sticks to green areas where cyclists are kept separate from road traffic. Air pumps have been installed at several points. The main aim is to encourage 20% more people to cycle long distances to work or study, but it’s also great for a day out. The route out from Copenhagen reflects how the modern city has evolved. It starts in Frederiksberg, where many roads are still dominated by large villas and mansions rather than tenements. Frederiksberg became an autonomous part of the capital in 1857, the year after the ramparts were demolished. This district, along with Østerbro, soon became the preferred haunt of the well-off. The next stage of the city’s development is reflected in Vanløse, an old village swallowed up by the city where tenements sprang up in the early 1900s as the city suffered growing pains. As you approach Albertslund, the architecture is more and more recent, and the final stretch between Glostrup and Albertslund is green and rural. For those with the stamina, continuing on to the West Forest, Denmark’s youngest large forest, is an ideal way to spend the rest of the day. The Albertslund Route, C99, opened in 2012. The Farum Route, C95, opened in 2014. A total of 28 routes are planned, covering 500 kilometres. Ask any Dane to name the most heavily forested area in the country and they’re unlikely to come up with Albertslund. But 40% of it is forest, compared to approximately 26% in Silkeborg and 24% on Bornholm. The landscape varies greatly along the route, which crosses the Green Path in Frederiksberg, Damhus Lake, Damhus Meadow, Grøndal Park and the West Forest. The route is suitable for wheelchairs. There are several places to stop, and you can always take a quick detour into one of the towns that line the route.